Here’s the story on the Massage Envy Scandal. Last Sunday, November 26,2017, this story hit the news. I first saw it in a Yahoo post. The headline reads: How a nationwide massage franchise is dealing with hundreds of sexual assault allegations. The original story as far as I can gather is a new story from Buzzfeed. You really should read that one. The major difference in this case is the way that ME handled (or didn’t handle) the claims. According to the claim, their main goal in handling such cases has been to do everything they can to avoid publicity and save their brand. The Change.org petition Massage Envy needs to support individuals sexually assaulted at their stores and make amends. 2) how massage businesses, of all kinds, respond to these maters when they are brought to their attention. * One look at these cases by a professional colleague indicated that as many as 30% of these cases found in the national news cycle involved unlicensed sexual predators who were using “massage” as a means of enticing victims into compromised settings. With this in mind it’s appropriate to recognize that much of what has driven the recent interest in all of this is how Massage Envy responded to these complaints at the franchise level. The main incidence actually happened a few years ago. A ME insider did say that the corporate office was under different management a few years ago and that they were removed because of this. Self-care programs focused on body mechanics, warm up and recovery techniques to empower massage therapists and estheticians to put the same focus on themselves as they do on their clients, so they can continue practicing in the profession throughout their career. Continuing education courses which Massage Envy has made free to employees of its franchised locations. Training for Massage Envy franchisees and managers so they can better understand the needs of therapists, and more successfully lead and support their teams. Career support including research and strategies regarding compensation and career development for massage therapists. From the ME website. From the AMTA website. I have many questions around this relationship and they have not been very forthcoming about their relationship and what they are doing and what they are working on? Did AMTA not know that this was a major problem for the ME franchise when accepting their offer for help? Did ME ask AMTA because of this issue in the first place? Who decided to cover this up – ME or AMTA or both? How much are they paying AMTA? What exactly are they doing together? To quote from the foreword to our Massage & Bodywork article, “We believe one of the best ways to curb sexual abuse in massage therapy is to sear the problem with bright light and constructive conversation throughout our community.” The BuzzFeed reporting provides a bright light, and a necessary reminder that protecting our clients, our profession, and ourselves is paramount. As you may be aware, ABMP’s motto is expectmore, which is both an invitation and a challenge. We invite our members and prospective members to expect more than the status quo from any other association or insurance provider, and we challenge ourselves to deliver on that promise. We also expect more from others in this profession; we believe Massage Envy can, will, and must do better going forward. Each and every one of us must be part of the solution and accountable to each other. ME responded after a USA Today inquiry and said it was “heartbreaking”. Mid-summer they also had an apology on the Doctor Oz website Statement From Massage Envy on Sexual Assault in Their Stores (who has been a previous keynote speaker at AMTA) which apologizes to the many victims. Our hearts go out to anyone who has been through this terrible act. We and our franchisees are firmly committed to delivering the therapeutic benefits of massage in a safe environment, and we applaud those who are bringing these issues to light. Preventing these incidents is a top priority for our business and we’re proud of the work we do to minimize the risk that any such incident could happen in our independently owned and operated franchised locations. We have the highest standards and policies that ensure our franchisees employ a rigorous hiring process, including accredited background checks and compliance with state licensure or certification requirements. Our required training program, including our Behind Closed Doors course, is a model for teaching safe, professional practices, and we expect that the 25,000 therapists employed by our franchised locations treat every client with respect. When a franchisee reports a violation of our Zero Tolerance Policy, our policies make it clear that the franchisee is required to restrict the therapist from working at any of our Massage Envy franchised locations. We are passionate about giving every Massage Envy customer an exceptional and safe experience. We are also looking beyond Massage Envy and partnering with industry groups and leveraging technology innovations to develop programs that will improve the safety of the entire industry. Now Massage Envy has a letter right on the homepage of their website. So were they not screened originally? Were there not any training courses in place across the nationwide franchise? Why are some owners aware of how to handle these issues and some were not? How in the world could you not have policies in place on how to handle the bad apples? How has this gone on for so long in the massage profession? Better yet – how did these people get into and through massage school and get a job? There is More too this. As I read the many massage forums with discussions on this, now there are also many massage therapists saying that they were attacked by clients and ME did nothing about it. That will be a whole other thing to address. Does ME and our professional associations know that is going on? This isn’t just a ME issue. Massage Heights is also getting hit with a law suit . I am guessing that in a few months this will really be widespread with hundreds if not thousands more coming forward. It is OUR issue- the massage profession’s issue. How the professional associations respond matters. How each individual massage therapist responds matters. The Board of Massage then created new Rules regarding draping and breast massage to make it clearer that this type of touching and draping are wrong. They said it would help them in prosecuting these types of cases. No profession is immune from inappropriate behavior and sexual assaults but massage has the added feature of actually applying touch to vulnerable (naked, under a sheet) clients. Sometimes I wonder why we are surprised by all this especially in a profession where touch is being applied often in a dark, warm room. When I asked in my Facebook group, what training are you getting in massage school around inappropriate touch, the answers were….bleak to none…to read a book. Even in Canada where the education requirements are 2000 hours of education compared to the average 500 hours required in the US, is not immune to problems around inappropriate touch as talked about in this Massage Therapy Canada article. The Attorney General in IL is upping the cause by doing a full out investigation. Illinois Attorney General Lisa Madigan has subpoenaed Massage Envy as part of an investigation into whether the company properly handled the allegations according to the Chicago Tribune. I do also know that more Attorney Generals offices have been contacted about this issue. The WA State Board of Massage has also been working to address these issues by creating new laws around breast massage (WAC 246.830.555), draping (WAC 246.830.560) and specific standards of practice outlining what can be touched and what can’t (WAC 246.830.550). At the last Board of Massage meeting our local ME group submitted a document AGAINST raising the number of hours of education saying that it would further discourage people from going to massage school because of the extra cost. They are having a very difficult time finding enough employees to staff their offices as is everyone else in the state and in the US. I told them a few years ago, that the problem was low pay and difficult working conditions. Who would want to go to massage school only to get paid $15 an hour and depend on tips when you can get paid $14.00 an hour at Whole Foods or Jiffy Lube? NOW who wants to go to massage school with this all over the national news? In the US, we really need a place to begin to address this issue. Lavon Watson of Watson Consulting Services, recommends an independent research study be done to find our more about the people who choose to cross the lines. There are obviously more men than women committing such acts but are there some women hiding in the wings assaulting massage clients in the dark? We need to know. Men in the massage profession are taking the brunt of this newstory – should men be massage therapists and should women be going to men to receive massage? How would we screen out the not so ethical ones? I for one suggest that we support the male therapist much more. I even once tried to start a group for men in massage so they could have a closed forum for discussing their concerns. Massage Today has a column – Women in Bodywork – any room there for the guys? Make this right ME. Fire everyone involved. Prosecute to the fullest extent. Create TV ads for the Superbowl and a follow up ad campaign for the next 10 years to save your brand and maybe give some credibility back to the massage profession. AMTA/ABMP – open your eyes. Stop accepting money from this company until they clean up their act. That doesn’t mean you have to abandon 20k therapists. You can still support them. It isn’t just about ME anyways. This has gone on way too long all across the US and more needs to be done. To AMTA/ABMP – set up very specific training for ALL massage therapists and require clinical supervision. Encourage your chapter boards to work with their state boards to create language in their state laws that require such training. Make it for the people thinking about being pervs as well as how to handle pervs on the massage table. If your local AMTA won’t help, consider starting a new State Association for your area. To employees of franchises – It is a massage therapists job market right now. Negotiate, negotiate, negotiate…whether you want to stay or not is up to you. Even with a good branch and owner, there will be blowback. Make your stand. This is not about you but is unfortunately about a company you work for, whose parent company has brought a dark shadow on the work you do. I know many of you have great jobs there and work for great bosses/owners, so if you want to stay, make sure everyone knows you are different. To self employed massage therapists – step up your game. You might be getting more clients very soon. To all massage therapists – choose the company who provides your liability insurance based on where you want your money to go to. Use an intake form and have a statement of informed consent on your website and in your office so they can sign it. Create REAL massage campaigns like the one that AMTA-WA created in about 2013 but have been unable to promote – REAL massage is Responsible, Ethical, Accountable and Licensed. This is our wake up call to get our act together and become the profession I know we can be. What will you be doing? This is not just a ME problem, it is the problem of the WHOLE massage profession. I first wanted to use the video of Barney Fife on the Andy Griffith show saying “Nip it, Nip it in the Bud”. (This calls for action and NOW. Any youngster going wrong, you have to Nip it in the Bud). If you thought the focus of the International Massage Therapy Research Conference would be just about research, you would be missing the whole picture. 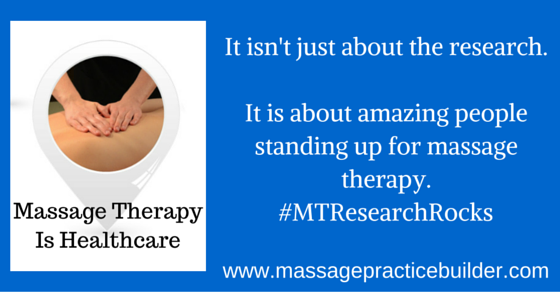 What the conference (and the Massage Therapy Foundation) is about is more than just the research. It is about the few people who are standing up for the massage profession to move us forward into being accepted as health care providers. Did you know that more and more hospitals are integrating massage into their treatment plans for all sorts of situations? Pediatric care, cancer care, pain and headache clinics and more. The Mayo Clinic even has a training program for their massage therapists to go through before they go to work in the hospital in the massage department. where they give massage post heart surgery even. It dawned on me later that the Mayo Clinic is in MN which is one of the last of the unlicensed states which I find very interesting. Why were they able to implement this in a state where massage is not even recognized as anything? It is because people like Dr. Brent Bauer (see bio on the Massage Therapy Foundation website) and Liz Dion, BCTMN, COMT are standing up for us and making this happen despite all the things holding us back as a profession like licensing. Did you know that there is a massage therapist who has been working in the Veterans Association for over 15 years providing massage therapy for our wounded soldiers? Allison R. Mitchenson, MPH, NCBTMB is doing just that. (Allison is the author of Integrating massage therapy within the palliative care of veterans with advanced illnesses: An outcome study) How was the big question – how did she ‘sneak’ in with all the red tape required to work for the VA? They don’t even have a job description for massage therapists which is the first big hurdle and she said they were working on it. Did you know that there are school programs designed specifically to teach you how to work in a hospital setting? Brent Jackson with Central Carolina Technical Institute has done just that. Best Practices refers to the best way of doing something. We need to figure out what is the best way of doing things with the patient/client in mind. Part of our work toward getting accepted by the medical profession is working to ‘get the camels nose under the tent and the rest will follow’ as Dr Chester ‘Trip’ Buckenmaier III, exclaimed in the panel presentation on Saturday. Once the camel gets their nose under, it will open the door further for bigger things to happen. Once we get more massage therapists hands on people, there will be no stopping us. ‘Trip’ also recommends that we “Stop saying Alternative. We give permission to the establishment to ignore us.” We want to be mainstream. “Medicine is not a science, it is empiricism founded on a network of blunders.” ~Emmet Densmore ( 1837-1911). It’s a blunder not to have massage as a routine part of American medicine. “To get there we also have to stop trying to destroy something that you want to be a part of” according to Brent Jackson Brent Jackson, BS, LMT, LMT and academic program manager for massage therapy at Central Carolina Technical College. The CCTC program includes hospital based massage therapy. “Why don’t doctors want to refer to massage therapists? Because it is a crap shoot as to who they will get.” Our education needs to start including more information on how to work with doctors and hospitals and Brent is leading the way for more school programs. We need more training in healthcare laws and learn to keep quite and stop attacking the establishment in to start the revolution. Oh and yes, there are many people working on the research part and No I still don’t understand research. I don’t know what all the charts and data mean most of the time. I don’t know how to analyze research even though I have taken a few classes on how to do that. I am just not interested in it and don’t get it since it seems that everyone has their own analysis. Was the big meta-analysis study that was sponsored by AMTA/Massage Therapy Foundation and the Samulei Institute ‘good research’? The Facebook discussions on this are questioning this and I just try to stay out of it and don’t understand it and frankly don’t care anymore. Here is information on the study that I haven’t read yet…but plan to. What is important is that The Samueli institute has opened doors for the profession to Department of Defense and National Institute of Health and our relationship with them is a beginning. That was just from the one day – Saturday- that I attended. My other duties kept be from being there on Friday and Sunday which I now wish I had attended. My overall impression is that this is the association that you want to be supporting. This is the one conference that you will want to attend if you have hope for the massage profession and want to keep moving it forward into healthcare which is one of my passions. They are doing so much more than just research. These researchers/leaders are moving us forward not only with their research but with what they are doing. They are taking a stand for the massage profession to help make it great again! The Revolution has already begun. Yes the medical system and healthcare system are broken and dysfunctional, but massage therapy does have a place there despite that. I see massage therapy becoming the main treatment method for what ails us – pain, stress, depression, anxiety and more. This is the Association that will help make that so. I just read your announcement on your new specialty certification on your website and I have many questions. How does this help the profession by certifying ONE School? Two other school owners mentioned on Facebook that they would be doing the same – I am not sure if that meant they are adopting the same program or doing a certification of their own. Last I heard from a few leaders in the massage profession, NCBTMB was to work on specialty certifications for like a modality – sports massage, injury treatments etc. What has happened to that? Are you planning on certifying more schools in a specific type of massage or specialty or are you going to work on a separate specialty certifications? Right now NCBTMB has a very big image problem and your recent launch did not help since it was lacking in any clear communication about what this really is, what it means for the massage profession and WHY you are doing this. Your past track record has not been forgotten and too many massage therapists see your organization only as a way to take money from unknowing therapists (the old national certification trap). I thought you were on the right track with creating a Board Certification and would think you have enough to do with that since the public, medical professionals, insurance companies do not know who you are or what it means and it has no meaning to anyone. But again, I was initially against it as you had not really clarified what it was about or the meaning it has. A massage school teacher later explained it to me saying that doctors, hospitals and insurance companies would recognize a Board Certification More because they are familiar with that terminology with doctors and it would give us a better standing in that arena which is what we truly need as we are getting eaten for dinner by insurance companies right now especially in WA State where I have worked as a massage therapist for over 28 years. If that is true, you may just want to focus your efforts on building your reputation and sharing the meaning of such a certification with insurance companies and hospitals and medical professionals. You might want to focus on repairing your reputation with massage therapists too. I hope you can explain your motives for this type of certification and why you are doing this? What meaning does it have for massage therapists? How will it help us survive and thrive as a profession? Are other schools doing this? Why? How will it help them? How will it help the profession – the massage therapists working day in and day out – who are mostly struggling to make ends meet. Right now it just looks like your board members/staff are creating this for their own schools which would be a real conflict of interest, but I am assuming there is more to it than that and hope you can clarify. I await your reply and hope that this gets into the hands of all the board members. After writing the letter, I did get a little bit more info from asking questions and reading in a few Facebook forums. There will be more schools applying for this certification which means creating programs and courses in their schools to fulfill the requirements – whatever they are. I do know that the schools are also struggling to get students and the demand for graduates is higher than the number of graduates looking for jobs. There has been continuing debate over the cause of this – is it because the schools have fallen behind? Is it that the pay is so low for entry level therapists that no one wants to be a massage therapist anymore? Is it that the growth years for the massage profession has finally taken it’s toll? The problem then is still – what does this mean? What will it mean to doctors and hospitals? How will they get this info into the medical professionals hands and have it mean something? This really has been the problem with the NCBTMB from the very beginning. The NCBTMB started with the so called “National Certification Exam” which really was not National – it did little to help massage therapists move from state to state as far as I know. Healthcare providers and hospitals had little knowledge of what it was or what it meant. A few employers used to require that their employees be Nationally Certified but to me that is meaningless. The struggles with the NCBTMB have continued through the years as they lost their footing (an the majority of their income) when the MBLEx exam was created by the Federation of Massage State Boards. Now they are trying to recover and survive. The Battle over CE continues also. They have been the only organization credentialing CE providers but the Federation of Massage State Boards wants to take that over too. The most recent announcement is that they would work together on overseeing CE. I was also just looking to find the NCBTMB’s financial status through Guidestar (create free login to view this info) but they have not reported yet on 2015 which is normal and I could only find data from 2014 when they were still getting money from national exams. Most of the money came and went for the exams from what it looks like. I am wondering what their financial status is now. Will they have the money to sustain this new program and their current Board Certification in the coming years? What are they doing to get the word out to the public that their requirements and credentials have any meaning to the medical professionals and general public? I have many other concerns too. Massage therapists are already being trained in things like this at schools and through CE courses and they are working at hospitals and in medical environments. In WA State we are accepted by the health insurance community but it was because of ‘the every category law” that makes it mandatory that health insurance cover massage. 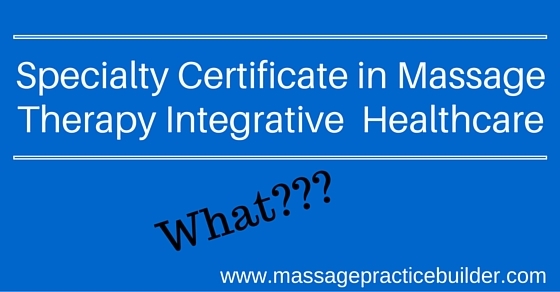 The terminology for this specialty “Integrative” is also interesting. Integrative is now being used instead of the word complementary. Complementary, Integrative , Alternative all indicate something that is not mainstream. What about being just part of mainstream health care – not complementary…not alternative… not integrative but a separate branch of medicine? See: Complementary, Alternative, or Integrative Health: What’s In a Name? from the National Institute of Complementary and Integrative Health (formerly National Center for Complementary and Alternative Medicine (NCCAM). Also just to be clear – this is not an attack or commentary on the actual program that is being offered at Central Carolina Technical College (CCTC). I know it is great and a lot of time and energy went into the program and making this all happen. Kudos to Brent Jackson for it’s creation and implementation. I just wonder what effect it will have on the future of the massage profession. I hope I am wrong in thinking that it is meaningless to have this certification and the NCBTMB will do something to make this have some meaning in the healthcare profession and to the general public. For more info on the NCBTMB from Laura Allen . AMTA National Elections – What you don’t know. Today AMTA National announced their selections for their annual election. Last summer they had changed they way members vote to a YES or NO vote for the panel that AMTA National Board members select themselves. AMTA created a commission to choose the board members that they want to work with. This is a common practice for boards in general, but it is not common for boards of associations that say that they are ‘member driven’. They seemed to change this quietly without much fanfare but to me it really seems like a big deal. It seems to me that AMTA is more committed to have a nice board that doesn’t rock the boat than addressing the difficult tasks of ensuring massage is a part of healthcare, through CPT codes that include massage therapy as practiced, and through inclusion on insurance panels.” They would easily argue that it is in their strategic plan to work towards massage as healthcare, but they are not doing what we know will make that a functional reality. that is more the issue. But here is the thing you don’t know…. You don’t know who had put their application in for each position that was open and you don’t know who actually got kicked out. Diana Thompson, author of Hands Heal, Documentation and SOAP charting expert, former President of the Massage Therapy Foundation, current AMTA-WA 2nd VP and a pillar in the massage community here in WA and across the nation for over 35 years had put her application in to run for a position and was denied. She stands for everything about massage therapy becoming part of health care and massage therapy being accepted by health insurance and getting recognized by the medical profession. Teri Mayo, the current AMTA-WA 1st VP, owner of Mayo Therapy Associates Medical Massage Clinic, and advocate for medical massage therapy was also running and she was denied a position. Glyn Desmond, also of WA State, owner of Monroe Therapeutic Massage (a large multi-clinic medical massage office) IS currently on the Board of Directors but he just got nicely fired with his term being up in 2/16 meaning he was not selected for this new slate. In the spring of 2015, he was also appointed to a committee that dealt with creating new CPT codes after they so nicely let Susan Rosen (another leader from WA State) go after she had spent the last 9 years in the committee protecting our right to use the new CPT codes. (See article on what happened) Now I am really concerned. Who is watching over the codes for us that are such vital part of our profession here in WA and across the nation? These three leaders from WA State were and the message is clear to me: AMTA National wants nothing to do with being a part of healthcare. They don’t value the importance of the CPT codes and the future of the massage profession. Vote NO if you are an AMTA member and demand something better. If Diana, Teri and Glyn, don’t get back into AMTA National, there really is not much left except a great social club which is important too. I in no way am saying that those who were selected are not deserving of recognition and deserving of these positions. There were just much better, more powerful, more progressive thinking massage therapists who wanted to help get AMTA National back on track. There just is truly something amiss. I am not saying that every massage therapist will need to accept insurance, but for years now I have been leading a quite revolution with a closed Facebook group helping people who do want to be able to bill and get paid by health insurance. This includes many hospital programs and massage business owners who want to see massage paid for and recognized for what it is. Massage Therapy is medicine. Could it one day be the number one treatment for headaches, pain, fibromyalgia, carpal tunnel and more? I think so. 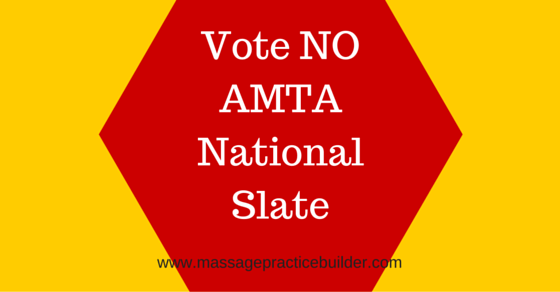 If you are an AMTA Member, please vote NO. They apparently don’t have a plan if the slate is rejected so that will be interesting in itself. Write to Every AMTA Board Member and voice your concerns. Tell them what you do want. Join my closed Facebook group to work toward health care integration. Learn to bill insurance : health insurance, car insurance and workers compensation. I have written a book to teach you how insurance works so you can start learning the process and learning what you need to do to get paid. Just Say NO…… HELL No…. In all clarity: I AM NOT an AMTA member and probably will never be because of things just like this. I was a member and did get involved in the AMTA-WA Chapter for a few years and could see that they were different than National. I personally never liked the AMTA National Politics and Positions they took ever since they started the NCBTMB which was supposed to be an entrance exam for AMTA and not this National thing which was never a true National License. Why do I care about this as a non-member? About 5 years ago, I went to AMTA-WA and asked every person I could find about what we could do about falling insurance reimbursement rates. I never did get an answer except if that we could do something we would be doing it. I did get involved for a few years and even was hired for a short time to work on their new website. In the few short years of me volunteering, I have seen too much politics and downright BS. I have since dropped my membership and still support what AMTA-WA is doing. Writing an money autobiography is one of the first steps in getting out of debt and becoming more conscious of your beliefs about money. The amount of money you have or don’t have in your life currently is a reflection of your beliefs about money that were formed in the past. How your family talked about money and how they taught you about money is carried into your own life whether you are conscious of it or not. Begin with your early childhood even if you don’t remember much. 1) What is your first memory of money? 2) Who handled the money in your family? 3) What did your parents do to earn money? 4) What do you remember about how your family made large purchases? 5) What is your earliest happiest moment around money? 6) What is your earliest unhappy memory around money? 7) How did your family communicate about money? 8) Was money ever discussed in your family? 9) Did you ever steal from your parents or siblings or other family members as a child? 10) How much money did your family have compared to your childhood friends? 11) Did you get an allowance? 12) How did your parents respond when you asked for something? 13) When did you begin saving money? 14) Did your parents trust you to go to the store to buy something? 15) At what age did you start working? 16) Did you have to start working or did you want to start working? 17) Did anyone help you decide on a career based on how much money you wanted to make? 18) What messages did you get from your parents about career, earning money and spending money? 19)Did you save and plan for college? 20) What is your view on money and dating? Who should pay for dates? 21) When did you get your first credit card? What were your feelings about it? When did you start using a credit card? 22) What kinds of things do you buy on your credit card? Do you ever by groceries or necessities? Do you make big purchases like cars, appliance or other expensive things with your credit card? 23) How do you feel about using Credit cards? 24) Do you know what interest rate you are paying and how much you owe? 25) Do you have any money secrets that you have never told anyone about? 26) Do you talk to your friends and family about money – how much you have or don’t have, how much you make or how much they have and make? 27) How much money would you like to be making? What feelings does that bring up for you? 28) What do you feel when you see someone driving a Mercedes or Bentley or living in a big mansion? What do you think about people who have a lot of money? 29) How do you feel about spending money on yourself? 30) How do you feel about your living space and how it represents you? 31) Do you know how much money you have right now? Do you know how much you owe right now? While there are plenty more questions to ask yourself about money, I’ll stop there and let you start answering these questions. You can answer them specifically or use them to write a story about money and your life. When you can uncover some of the feelings that you have about money, you can then begin to change the feelings. Becoming aware is the key to changing anything. Once you write your money autobiography you can then begin tracking your income and expenses to get a better idea of where your money is going and start thinking more about what it is that you want to do with your money. I have been wanting to write this post for about a year after many massage therapists found themselves a victim of a scam, fraud and identity theft last year. How do you know if you are buying something from someone who is an honest person? How do you know if someone will just take your credit card and keep charging it for goods not received or use it to buy other things for themselves? How do you keep yourself safe from the many online scams and scammers trying to take advantage of you online especially? First up, the person will clearly identify themselves and have pictures of themselves on the about page of the website. If they don’t say who they are, ask them. If they don’t want to tell you be skeptical. If they are not up front, they usually have something to hide. Check the whois.com listing for the domain to see if their name matches who owns the domain. We do have domain privacy now so that is not always an indicator. Domain privacy helps today because so many scammers will start contacting you because of your public domain listing. – Upload an image (First Download image and save to your computer from Facebook profile or Website) and upload image in question. Be suspicious of unknown people who just start following you or request Friend status. Check their Facebook profiles/pages. A reputable business owner with a Business Facebook page, will have show their personal profile in the About tab on the Facebook Timeline. Call your local police department if they are local.